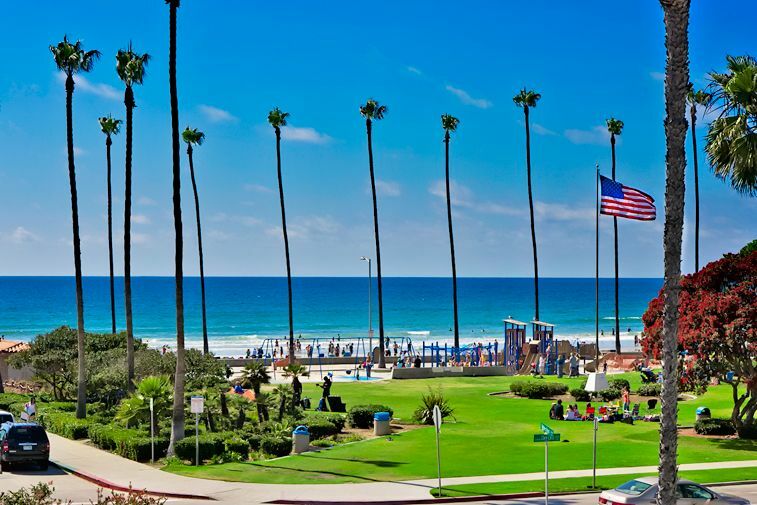 Watch the surf and sunsets from your balcony overlooking Kellogg Park and La Jolla Shores of the most popular and beautiful beaches in San Diego county. This two bedroom, two bath condo is ideally located in the heart of La Jolla Shores Village and is in walking distance to everything you will need. Of course, the beach and park are just steps from the front door, but in addition within a few short blocks there are multiple restaurants (both casual and fine dining), as well as kayaking, bike tours, surfing lessons, scuba diving, shopping, as well as a local grocery store. The quaint neighborhood setting, pristine beaches and parks, and centralized location all combine to make this condo perfect for a beach getaway. This top floor condo has two bedrooms and two baths. The roomy master bedroom has a queen bed, a 32" flat screen and private in suite bath. The second bedroom has a queen bed, 25" flat screen and a shared bath. Additional sleeping space for a 5th guest is provided with a sleeper sofa located in the living room. The ocean view living room offers comfortable seating for five guests and the well stocked kitchen comes fully equipped with everything you will need to prepare meals.. In addition, there is also a private ocean view balcony complete with lounge chairs and a gas BBQ grill where you can spend your afternoons enjoying the cool ocean breezes and the magnificent La Jolla sunsets. Additional amenities include underground parking for 2 average sized vehicles, WIFI (wireless internet), cable TV, DVD, NetFlix, washer/dryer, child booster seat and beach towels, chairs and accessories. Whether you chose to relax on the balcony with a cool drink and book, or pack your day with activities and fun, this La Jolla Shores Condo home is the perfect place to experience all that La Jolla has to offer. We had an absolute blast at this condo! The location cannot be beat. We overlooked La Jolla Shores and were just a few steps away from the sand. We felt like the beach was our front yard…it was great! Upon arrival, the home was clean from top to bottom and all of the beds and couches were very comfortable. One of our favorite features was the outside patio that overlooked the ocean. It was nice to have a cup of coffee while looking at the waves and watching the sunset in the evening. Whether we were inside or outside, we always had a view of the ocean. It is exactly what we were looking for. The home was beautifully decorated and had everything we needed to feel like we were at home. The whole process from booking, to getting the keys, and checking out was a breeze and we are thankful for a pain free process. We cannot wait to do it again! Great views and great location! Right off the bat, the service we received through Seabreeze was top notch. It was such an easy process and they helped every step of the way. This penthouse was in great condition upon arrival and we really enjoyed all aspects of it. The location was more than we could have asked for; having the ocean views from the outdoor balcony made relaxing and having morning coffee that much more enjoyable. The space was the perfect size and it was great to use a fully equipped kitchen. This would definitely not be possible if we were staying in a hotel. We really felt at home which is what we were looking for. The proximity to the beach and the Village in La Jolla created such a nice experience for us and we really were able to experience life in La Jolla as the locals would. The beds and couches were also in great condition and very comfortable. We absolutely had a blast! Great place and location. A spare set of keys would have been nice, but not a deal breaker. Great to have beach stuff handy, thank you. Spare garbage bags would have been nice as well. Great location, but outdated and dirty. The communication management company was great for check in, etc. The location of the property was perfect, but the property itself was very outdated and not maintained well (i.e. kitchen &amp; bathroom fixtures; caulking needed around sink in kitchen). There was junk just thrown in drawers and it appeared very unorganized. We didn't know about the pullout bed in the main room, so we used an air mattress all week. Lastly and most importantly, we were not made aware until the day of that the property was going to be showed to a prospective buyer and we were imposed upon during our vacation. The owner who came to show the property acted very indifferent and didn't care about our privacy. We will vacation again in La Jolla, but will not stay here again. This was my first experience staying in a vacation rental as I usually frequent hotels. Requests for the property manager were replied to promptly. The space was bright comfortable and spacious for our week long stay. The linens and towels as nice as any five star hotel. The kitchen was better equipped with cooking supplies than my own. They had absolutely everything to prepare anything possible, even a coffee grinder! We will absolutely recommend this company and even this property to friends and family.